Follow this link to access the original Science article and online supplement. The majority of participants ranked the changes in order of the linear increase in improvement in mpg, (16 mpg for A, 10 mpg for B, etc.) However, in reality, B and D save more gas than A; D and E save more gas than C. Only 1 participant in 77 gave the correct order in terms of gas saved per 10,000 miles: B (198 gallons), D (125 gallons), A (94 gallons), E (38 gallons), C (30 gallons). The A vs. B comparison is close to a family decision we made (to replace a minivan that got 18 mpg with a small station wagon, or to replace an efficient sedan with a hybrid compact). We were surprised to discover that option B saves twice as much gas as does A. Over 10,000 miles, B saves 198 gallons; A saves 94 gallons. Study 2: A second study asked college students to price the gas savings from adding more efficient engines to a car that gets 15 mpg and costs $20,000, where the only feature that varies across vehicles was the mpg. Linear reasoning led them to undervalue improvements to 19 and 25 mpg and overvalue improvements to 55 mpg (under a range of discount rate assumptions). 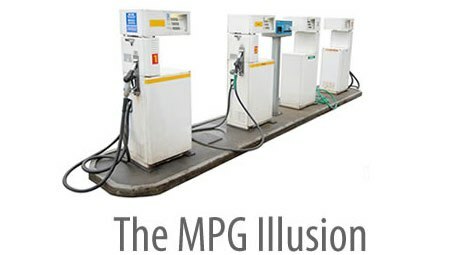 Study 3: A third study showed that the mpg illusion could be broken by expressing efficiency as gallons per 100 miles (GPM). In this study, we asked a cross-section of adults to think about a town’s fleet of vehicles that all drove 10,000 miles per year. Half the vehicles in the fleet got 15 mpg and half got 34 mpg. Participants were asked to choose between 1) replacing the 15 MPG cars with vehicles that get 19 mpg, or 2) replacing the 34 MPG cars with vehicles that get 44 mpg. Three-quarters preferred the second option when expressed as mpg. However, when gallons per 100 miles (GPM) information was also given, 64 percent correctly preferred the first option (replacing cars that got 6.67 gallons per 100 miles (GPM) with cars that got 5.26 GPM) to the second option (replacing cars that got 2.94 GPM with cars that got 2.27 GPM). Option 1 (14 to 19 MPG) saves about 1.4 gallons per 100 miles compared to Option 2 (34 to 44 MPG), which saves only .7 for every vehicle replaced. In our scenario, Option 1 saves 14,035 gallons of gas per year; Option 2 saves only 6,684 gallons of gas per year.